The World Puzzle Federation‘s rolling Puzzle Grand Prix contest has its fifth round this weekend. It’s a free-to-enter online puzzle contest where you are given an hour and a half to score as many points as you can by solving paper-and-pencil puzzles. You can start at any point after 11am UK time on Friday and must conclude by 11pm UK time on Monday. This fifth round is particularly interesting to this site because it’s being set by puzzle authors from the US who have chosen to theme some of their puzzles in the “casual” section around what they’re calling “Escape the Grand Prix”. For all intents and purposes, don’t worry about the distinction between the “casual” and “competitive” sections unless you’ve been solving every round and getting almost all the “competitive” puzzles correct; just solve whichever puzzles seem most entertaining, whichever section they’re in. Take a look at the Instruction Booklet which is a 3.3 MB .pdf file; the booklet hints at the sort of tricks it might use to secrete digits’ identities throughout and also shows you what other types of puzzles there will be on offer in the contest. The contest goes out of its way to offer puzzles in a wide range of levels of difficulty, and you know what styles of puzzles will be featured in advance so you can have a good idea whether you’ll enjoy them or not. You can even get some practice in on the types of puzzles that you know you’ll be facing in advance, if you like. The first four rounds were great fun and this one should be even more so! There are exciting puzzle competitions coming up soon, both in person and online. The online contests take place this weekend, the in-person ones next weekend. The online contests are free to enter and you can do so at a time and place of your own choosing; the in-person contest has a specific time and location and fees must be charged to cover the cost of booking it. The second round of the World Puzzle Federation‘s Puzzle Grand Prix series takes place this weekend. It’s a 90-minute contest, which you can start as soon as 10am on Friday 19th February but which you must complete by 10pm on Monday 22nd February, so you have half a week in which to pick your 90-minute window. (Those times are the ones quoted in theory, the ones in practice may be an hour later.) This set of puzzles has been devised by the Slovak team. As with the previous round, the puzzles have been divided into Casual and Competitive sections, with the Competitive section more traditional constraint-based grid puzzles and the Casual section slightly more freeform, though not necessarily easier. Log in to the GP series web site then download the instruction booklet to find out the types of puzzles in advance, then plan your attack. If you prefer Sudoku, though, then Logic Masters India have a contest for you this weekend where the puzzles have been devised by Belfast’s David McNeill, the over-50 World Sudoku Champion – and over-50 World Sudoku Champion, too! David has been a mainstay of the UK puzzle scene for well over a decade and is a very experienced puzzle setter, so this promises to be a treat. This weekend’s contest is called Triplets and Triangles; it too is a 90-minute contest, available between Saturday 20th February and Monday 22nd February at times to be confirmed. The contest has 14 puzzles, starting with classic 9×9 sudoku, running through some variants themed as the title of the contest suggests, and ending up with some brand new puzzles that seem to combine two other variants into a single new challenge. 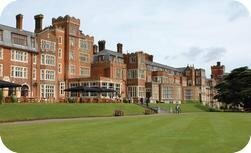 In person, the UK Puzzle Association are running the UK Open tournaments in sudoku and puzzles on 27th and 28th February at the Selsdon Park Hotel near Croydon, pictured above; increasingly this has become the home of puzzles in this country, most famously for being the site at which the UK held the World Championships in 2014. Again the instruction booklets have been posted; most notable is Bram de Laat’s second round, “Two to Five”, with sixteen different puzzles in four general styles: room placement puzzles, split wall puzzles, division/dissection puzzles and number puzzles. In each of those four styles, there’s a puzzle that relies on two-themed properties (pairs of cells, sets of two adjacent rooms, dominoes with two digits and so on…), a puzzle themed around threes, a puzzle themed around fours and a puzzle themed around fives. Delightful design! The event is always highly convivial so do take a look and see if it’s your sort of fun. As hinted at yesterday, the red lights have gone out and the first leg of the Puzzle Grand Prix season promoted by the World Puzzle Federation is now in progress. If you’re sufficiently interested in puzzles to be reading this site, even if you think you only like exit games and have never taken the time to enter a puzzle contest before, you should get excited about this season and think seriously about taking part. The puzzles are fun and there’s no charge for taking part. The name Grand Prix is an allusion to the tradition of motor races, for there are a series of rounds set by teams of setters from different countries; for instance, this is the Indian round, the next one is the Slovakian round and so on. (There are eight rounds in the competition, each four weeks apart, and your overall score is the sum of your six best round scores.) Each round is available for 3½ days, from 11am UK time on Friday to 11pm UK time on Monday. During that 84-hour window, you can press the “start the timer” button at a point of your choice and then have 1½ hours to score as many points as you can by submitting answers to the puzzles from that round. The types of puzzles are introduced a couple of days beforehand in an instruction booklet. The big distinction between this year’s contest and that of previous years has been an addition to the types of puzzles that are featured in the contest. Specifically, this year, each round will feature “competitive puzzles” and also “casual puzzles”. Competitive puzzles tend to be grid-based constraint-satisfaction puzzles where, as the name suggests, “the objective is to fill in information on cells in a grid, based on logic or numerical constraints“. The typical form is that there will be 6-8 types of puzzles per round, and usually 3-4 of each of those puzzles; usually the levels of difficulty will vary, but the baseline is pretty tough. However, as you know what sorts of puzzles are on offer in advance, you can get some practice in advance and see if you enjoy solving them. Specifically, this time round, the competitive puzzle types are Four Winds, Spiral Galaxies (see half-way down the page), Nurikabe, Skyscrapers, Slitherlink, Place by Product and a variant of the Tapa genre. It is expected that the best solvers in the world will be able to finish all 22 of these puzzles with a little time left over. This site commends the decision to add these extra puzzles, looks forward to taking part if time permits (for today is an anniversary and tomorrow is a travel day…) and would recommend the series to all readers. The more people who can find their style and level of competitive puzzling fun, the merrier! Looking through older posts, the preview post for the 2015 World Puzzle and Sudoku Championships has been left hanging without a review for a couple of months. Here’s a quick summary of the scores from Sofia. The sudoku championship was won by Kota Morinshi of Japan, who was number one going into the play-off as well as coming out of it, with the Japanese team victorious ahead of China and the Czech Republic. Silver medallists China took the top three places in the under-18 rankings, as strong a sign for the future as there can be. The UK finished eighth, taking the top two places in the over-50 rankings; David McNeill defended his over-50 title from 2014 and Mark Goodliffe was not far behind. In the puzzle championship, three-time defending world champion Ulrich Voigt took a commanding lead into the play-off final, but Japan’s Endo Ken overtook him in the play-offs to take the title for the first time. (There is some discrepancy in the conversion of Japanese names to Western counterparts, but this site tends to consider it polite to prefer the name ordering that he chooses himself; this year, at least, he could just be referred to as Champ.) The under-18 title was won by Yanzhe Qiu of China for a third successive year, finishing ninth overall. This site calls search engine dibs on the phrase “future World Champion Yanzhe Qiu”. The UK team finished seventh, within a gnat’s Kropki of equalling their best ever performance of sixth, and David McNeill won the over-50 title for both puzzles and sudoku. Congratulations to all the participants; I’m pretty sure that the UK teams are largely happy with their performances this year. If there’s a disappointment from an outside perspective, it’s that there wasn’t nearly as much coverage of the event as I’d have liked; Endo Ken has written up his experiences in English, modestly and honourably noting that he only won the play-off rather than the body of the tournament, but there’s little otherwise to share, unless you know otherwise. Back in October, this site proposed some odds, just for fun, and wasn’t too far off. True, the prediction was for Germany to only be second favourite, narrowly behind Japan, and was for the Czech Republic to be joint seventh rather than fifth. It gets a bit too close to being personal to say “If only _______ hadn’t got such-and-such a puzzle wrong!” Other than that, this site’s top seven is not looking too bad! The 2016 championships will take place in Senec in south-west Slovakia. Fly to Vienna in Austria then travel fifty miles East and you’ll get to Bratislava, the capital of Slovakia; another ten miles or so further and Senec will serenade you. The first chance to qualify for the UK teams for 2016 will be face-to-face at the UK Open Puzzle and Sudoku championships at their usual home of the the Selsdon Park Hotel near Croydon on 27th-28th February, with the top two finishers in each contest winning their places on the team! Way-oh, we’re going to Sofia! This week’s highlight is the World Puzzle and Sudoku Championships. After last year’s triumph in Croydon here in the UK, the 24th World Puzzle Championship and 10th World Sudoku Championship are being held in the capital of Bulgaria. The sudoku championships as such are held on Monday and Tuesday; the puzzle championship starts on Thursday and crowns its champion on Saturday. As ever, the puzzle writing is likely to be of the highest quality, but it has a tremendous way to go to live up to that of last year; you can see what sorts of puzzles will be featured in each one in the sudoku instruction booklet and puzzle instruction booklet. The actual puzzles themselves will need to be solved quickly enough to pose a challenge to befit the best solvers in the world; most mere mortals (hello!) would struggle to solve many of them given a whole day. It’s a fascinating championship and doesn’t receive a great deal of coverage as the global sporting event that it is. Exit Games UK covered last year’s championship intensely, being a home championship that will surely not be repeated for years, though all the signs point to the UK having done as good a job as any first-time host. This year’s event might not get quite the same extent of coverage as last year’s, but it’s far too much fun not to cover at all. The preview article is arguably the most fun of all to write – compare to last year’s! – though almost the most uncomfortable in the knowledge that you’re writing about real people and just possibly they might read what you say. For the avoidance of doubt, this coverage concerns the puzzle championship rather than the sudoku championship. As ever, one starting-point for treating the World Puzzle Championship as the sport that it is, is the Wikipedia article, but the motherlode is Tim Peeters’ site. You can get the results from the four most recent championships within the World Puzzle Federation‘s newsletters for 2012, 2013, 2014 and 2015, each with the results from the previous year’s championships. This year’s participants list points to there being representation from 30 nations in the puzzle championships; it looks like there will be (subject to confirmation) 23 full national teams of four solvers, plus another dozen or so “B” teams, possibly a couple of “C” teams and some number of transnational “United Nations” teams made up of assemblages of national teams that happen to be smaller than the full complement of four. It’s no secret that it’s cheaper to attend an event in Bulgaria than it is to attend one in the UK, and that has evidently made a difference. The 23 years of the World Puzzle Championship have only seen four different national teams win. The Japanese team won one, the Czech team won three, the German team have won five and the team from the United States of America have won the remaining fourteen. The US team has a 23/23 record at finishing in the top three places, though last year was probably about as close as it has ever been, the German team have finished on the podium 13 times in the last 15 years and the Japanese team’s unbroken run on the podium stretches back ten years. The Czech team were on the podium seven times in the first ten years; the Hungarian team have made four podium appearances and the Dutch team three, including two second places. Other teams on the podium have included Argentina, Belgium, Canada, Croatia, Poland and Turkey. At this point, it’s worth pointing out that these championships surely represent an amazing sponsorship opportunity for an exit game brand who wanted to present themselves as the global leader and attract attention from a great number of puzzling communities at a single stroke. All eight G8 countries are represented at the WPC, so is India, so is China, so are all manner of other exciting and relevant nations. The Escape Room Directory points to eleven exit games in Sofia, reportedly one practically across the road from the hotel. One can imagine that most of the games in town will be played in a wide variety of languages over the course of the coming week and word will get round as to which are the best. Let’s take a look at the top contenders, in descending order of last year’s finish. Germany won last year, though it was closer than the scoreboard might suggest because Japan entirely reasonably went for a go-for-broke strategy in the final team round. On the other hand, the German line-up have real strength in depth, with the German B team scoring enough to beat all the A-teams outside the top three, and the four German B team members all outscored the fourth-place German A team solver! This year’s A-team is starred by Ulrich Voigt, looking to add an eleventh world championship and to be the first ever to win four in a row. He is more than ably supported by Florian Kirch who finished third last time, Philipp Weiß (unofficial 27th last time, though unofficial 17th two years previously) and Robert Vollmert (unofficial 18th two years running). Michael Ley has a real chance at being the best B-team solver for a third time. If you can make it through the super-stacked German trials, you’re definitely good enough to be a play-off contender. A hugely strong line-up. Japan also has remarkable strength in depth; looking at the Grand Prix results, with seven of the top eighteen finishers over the course of the series (to Germany’s four! ), arguably even more so. Yet there were questions over the Japan Puzzle Championship that settled the Japan line-up; when the dust settled, this is how the chips fell. Ken Endo (who wrote that article) was second going into last year’s play-off and finished handily ahead of the pack in the Grand Prix, so is clearly a very serious contender for the individual championship. Kota Morinshi has finished ninth two years running and has also been excellent in the Grand Prix. Ko Okamoto finished fourth in 2007 and 2010 and almost matched Ken Endo as a guest two years ago. Maho Yokota finished 12th four years ago and 17th two years ago. This is again exceptionally powerful, though it’s tempting to wonder how much they might miss Hideaki Jo. The US team are powerhouses once again. Palmer Mebane has a four-year streak on the podium and was the last person to beat Ulrich Voigt, in 2011. Wei-Hwa Huang has won it all four times. William Blatt has finished in the top ten for the last two years, and the fourth member this time is Roger Barkan, who has three podium places to his credit. All four have shown that they know what it takes and there is nothing like a weak link here; this bodes very well for the team rounds. At this point, time to speed up and concentrate principally on the highlights of some of the other teams. Peter Hudak has earned three playoff places in the last four years for Slovakia and they’ll miss him badly this year, though Matej Uher, Matúš Demiger and Štefan Gašpár are all reliable top-30 solvers. From the Czech Republic, Jan Novotný and Jana Vodičková have had years where they’ve been well in the top fifteen; Hungary have three-quarters of their 2013 line-up who finished fourth, featuring 2007 world champion Pál Madarassy, five-time top-ten finisher Zoltán Horváth and Zoltán Gyimesi. Bram de Laat has a four-year top-ten streak for the Netherlands and is backed up with experience. What of the United Kingdom team? Exit Games UK is bullish. There’s something of a running theme above; nations with strong line-ups where it’s easy to think of one or two very strong solvers who would add considerably. On the other hand, this is the UK line-up that this site has long hoped for, as discussed; for this site’s money, it’s the strongest UK team yet. Neil Zussman and James McGowan have been top-15 solvers for the last two years, with this year’s Grand Prix form guide putting them on par with some very strong names. Tom Collyer has been improving year on year and being instrumental in hosting last year’s championships surely being a great way to get involved. David McNeill has five WPC appearances and has been top among the UK team for four of them. If you want a form guide that’s less than a month old, the team’s performances at LMI’s Puzzle Ramayan again hints at people being there or thereabouts. Apologies to the Polish, Turkish, Canadian, Chinese, Indian and other teams who do have strong solvers, but you have to draw the line somewhere. It would be a delight for any of them to take this as inspiration to prove this preview wrong, especially if that sentence has swept them aside into just the “and other teams”! Part of the fascination is looking for breakout stars who come from nowhere. It’s always thrilling. How well can the UK team do? At the start of the year, this site predicted a 35% chance that the UK team might beat its previous best performance of sixth place. Knowing the participant lists now, 35% may be a shade too slim. Four finishes in or around the top quarter, particularly with a couple close to the play-offs, would probably be good for fourth or fifth place, if the team round performances match up to the individual performances. It’s going to be very exciting to follow the team’s progress in Bulgaria! Coming in to writing this preview, the presumption going in was that Germany were going to be strong favourites. On reflection, Germany might have the strongest top half of the line-up and Japan may have the strongest bottom half. If the US perform close to their strongest throughout, they would surely be very hard to stop as well. For the sake of punditry, the call is going to be Japan, but it’s got to be really close! If you’re a competitive sort then there are a few interesting opportunities coming up. The biggest regular cash prize in the world of puzzles – at least, in this country – is that of the annual Sudoku championship held by The Times. Next week is qualification week, with a puzzle printed in the newspaper every weekday. Solve it and send your time in. You don’t need to be a subscriber to see the competition’s terms and conditions. Incidentally, the regular qualifier is because the world of armchair treasure hunts occasionally pays out bigger purses, as do related prize puzzles; notably, Eternity paid out a cool million pounds back in 2000. The 20 fastest solvers of each of the five puzzles, plus the eight best solvers from the previous year’s event, qualify to attend the finals. (The 100 qualifiers have to pay £25 per head for the privilege of taking up their place; last year’s top eight get in for free.) Whoever turns up on the day will take part in one of two one-hour, four-puzzle semi-finals; the fastest four from each make this year’s elite eight who shoot it out in one further round to win a top prize of a greasy grand in the hand, with second and third paying £200 and £100 respectively. You can find descriptions of finals day from 2013 and 2014, by Mark Goodliffe, who won the second of the two. That’s not the only way to win a thousand pounds with your puzzle-solving ability; Twisted Attractions have launched an exit game called Panic! in Birmingham with a thousand pounds being paid to the fastest team of 6-8 players to complete the game over the course of the four months or so that it’s open. More on this to follow. Alternatively, a contest that you can play against worldwide competition from the comfort of your own – but just for fun! – is the current (sixth of eight) round of the WPF Puzzle Grand Prix. This has been running all weekend, but you have until 11pm UK time on Monday night to complete the 90-minute paper, starting at a point in time of your choice. There are 24 puzzles: six different styles, four examples of varying difficulties in each. This round is produced by German authors; the Instruction Booklet reveals the six styles this time, and there are some corkers. You can practice Spiral Galaxies as part of the essential freeware Simon Tatham’s Portable Puzzle Collection, you can practice Skyscrapers, Snake, Japanese Sums (without zeroes) and ABC-Box at the wonderful Croco-Puzzle and Battleships has several sites devoted to it alone. Looks sure to be a lot of fun; if you can carve out 90 minutes, give it a try! The first round of the World Puzzle Federation‘s Puzzle Grand Prix competition takes place this weekend, starting at 11am UK time on Friday and running through to 11pm on Monday night. During that time, you can choose the 1½ hour window of your choice in which to attempt the 24 puzzles in the first round’s booklet. Register for the contest, log in, download the encrypted .pdf file containing the puzzles, use the web page to confirm you want to start your clock and then you will be provided with the password to decrypt the puzzle file. (You may want to print the puzzles out, but it’s not obligatory.) You can then submit answers to as many puzzles as you have solved as many times as you like before the 90 minutes expire. Shikaku Liars is a variant on the well-known Shikaku (Rectangles, etc.) puzzle in which a grid must be split into rectangles with given areas. At least one example in each of the eight types has been set with a deliberately low tariff, so you may well be able to get to grips with at least one puzzle of each type. 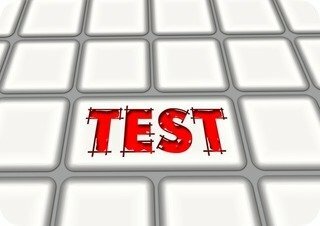 If you ever want to try one of these middle-distance puzzle contests, and participate in a global puzzle contest with likely hundreds of competitors from dozens of countries, this will be a genuinely accessible example of the form, and one where you can get familiar with at least most of the puzzle styles in advance. Simon Tatham’s Portable Puzzle Collection is a good way to practice, available at no cost on a wide variety of operating systems. This site has been updating its event calendar to celebrate the New Year. There are a great many puzzle contests and puzzle hunt events to look forward to in 2015, which this site will discuss over the coming days. Exit games have not had events as such to look forward to so far, but perhaps someone will find a convincing way to make an interesting event happen such that it might be featured in this site’s calendar for everyone to get excited about. The puzzle contest season each year peaks with the World Puzzle Championship and World Sudoku Championship, of which more tomorrow. Only the best can qualify for the national teams there, but the puzzle season at large isn’t restricted to the best solvers. For instance, Logic Masters India offer online contests in puzzles and sudoku each month. However, the World Puzzle Federation started their own annual Grand Prix series competitions for puzzles in 2014 and for sudoku in 2013. This provides a predictable, regular, well-organised global season for all fans. The competitions run on a four-weekly schedule; there’s a weekend with a sudoku competition, then a weekend off, then a weekend with a puzzle competition, then a weekend off, and the schedule starts all over again. Both seasons are eight contests long, starting in January and running through to the end of July – and this is because the first contest has already started. Each contest starts at noon, European time, on Friday and runs through to the end of Monday, again European time. Accordingly, there are just over 48 hours remaining on the clock for you to play this time. It’s free to participate; just register at the Grand Prix site. Download the Instruction Booklet and take a look at the types of the 15 puzzles, all to be solved within a 90-minute window of your choice. Each puzzle has a point value, so you can get a feeling for the difficulty; the most difficult puzzles will be well and truly World Championship difficulty, and the lowest-value puzzles will be genuinely relatively accessible. (The difficulty levels may well have been tweaked with the evidence of last season in mind, too!) You don’t need to play all either contests in a series; your best six scores will be counted. The top ten scorers are invited to the World Puzzle and Sudoku Championships to compete for the Grand Prix title in person. 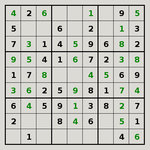 The first sudoku contest features six classic sudoku puzzles as well as examples of nine different sudoku variants: some quite familiar, some very innovative. It’s free, it’s fun, it’s familiar and yet with exciting twists; find a spare 90 minutes over the next day or two and give it a go! The World Puzzle and Sudoku Championships are happening in the UK for the first time this week at the Selsdon Park Hotel and Golf Club, just south of Croydon. The ninth World Sudoku Championships are already underway (see, for instance, a preview in the Independent on Sunday) and will crown their World Champion tomorrow; the 23rd World Puzzle Championships start on Thursday and run until Sunday Saturday ((ETA: Thanks, Ken!)). This site is particularly excited about the World Puzzle Championships and really enjoyed reading the competition’s Instruction Booket, admiring the inventiveness and ingenuity of the puzzles that – frankly – are way out of our league. Nevertheless, looking at the registration list, we can attempt to consider the championship as the sporting event that it is and make some predictions for the sake of them having proved wrong soon. A starting-point for treating the World Puzzle Championship as a sport is the Wikipedia article, but the motherlode is Tim Peeters’ site. You can get the results from the three most recent championships within the World Puzzle Federation‘s newsletters for 2012, 2013 and 2014, each with the results from the previous year’s championships. This year there are 22 nations who have sent national teams of four solvers to the World Puzzle Championships, though nine nations additionally have sent “B” teams and there are also nine “United Nations” transnational teams. (In total, there will be 29 nations represented at the World Puzzle Championships.) This makes this year’s event relatively large to those of recent years, though not exceptional. The 22 years of the World Puzzle Championship have only seen four different national teams win. The Japanese team won one, the Czech team won three, the German team have won four and the team from the United States of America have won the remaining fourteen. The US team has a 22/22 record at finishing in the top three places, the German team have finished on the podium 12 times in the last 14 years and the Japanese team’s unbroken run on the podium stretches back nine years. The Czech team were on the podium seven times in the first ten years; the Hungarian team have made four podium appearances and the Dutch team three, including two second places. Other teams on the podium have included Argentina, Belgium, Canada, Croatia, Poland and Turkey. The US team return three from last year’s championship winning team, headlined by four-time champion Wei-Hwa Huang and 2011 champion Palmer Mebane. William Blatt made it to the top ten last year to make the play-offs, as well. The change is that Thomas Snyder, four times on the podium for each of the World Puzzle and Sudoku championships (three times on the top step for Sudoku) has been replaced by MIT’s Anderson Wang. Big shoes to fill, but it would be a major surprise not to see their 22/22 streak on the podium become a 23/23 streak. Can they make it onto the top step again? Quite a few teams will have something to say about it. Ken Endo described the Japanese selection process in his blog; the Japanese team deliberately include one first-timer in their World Puzzle Championship line-up, so long as they make the top ten of their domestic qualifying contest, and fill the remaining places with the top three outright. This year’s new blood is Yuki Kawabe, backing up Hideaki Jo (who has finished in the top six for six years in a row), Kota Morinshi (improving from 26th to 11th to 8th over the last three years) and Ken Endo himself, who was top among the B-team solvers last year. Hideaki, Kota and Ken took second to fourth in this year’s WPF GP and Yuki was eighteenth. Several teams have two world class solvers and a few have three, so a large part of the destiny of who will win the world championship may come down to the strength of the fourth team member. Judging by the WPF GP results, Japan may have the strongest fourth member. The German team starts with Ulrich Voigt, bidding for his tenth title. His nine championships go back as far as 2000, and he’s not yet won three in a row – so a title this year would represent that distinction for him. He is well supported by his brother Roland, who finished second in 2002 (to beat Ulrich!) and who also has a sixth-place finish in 2011, when he hasn’t been involved running the German selection process. Florian Kirch finished tenth in 2009 and has three other top-20 appearances, and Martin Merker was very competitive as a guest last year, backing it up with 20th in the WPF GP as well. Very likely to be there or thereabouts once again. If this site is going to pick a team to make it onto the podium for the first time, it will be brave enough to pick Slovakia, who finished fourth in 2013. They return all four team members from last year; Peter Hudak made it to the top ten and took part in the play-offs and their other three members were competitive, finishing in the top 27 official places. Definite contenders, as experience counts a great deal. Similarly, the Czech team return all four from last year, and are likely to be there or thereabouts. The Dutch team feature Bram de Laat, ready to make a break for the podium after going 9th-7th-4th in the last three years, and two-time World Champion Niels Roest makes a return. Rick Uppelschoten makes his ninth appearance, a top-20 solver more often than not and Annick Weyzig has two top-40 places, so they too have definite outside podium chances. The Hungarians include 2007 champion Pal Madarassy and 2012 fourth-place finisher Zoltan Horvath, so are well in the mix. What about the home team? Neil Zussman and James McGowan enjoy a friendly rivalry at the top of the order, both finishing well in the top 20 last year, and both in the top 10 of the WPF GP this year, showing their form. They’ve both been red hot on qualifying tests in the past, not just winning the national title but beating all global competition in the UK Puzzle Championships of the last two years. Both will strongly fancy their chances of making it to the top ten and the play-offs this year. Steven Barge has three past WPCs to his name, finishing top of the UK solvers twice, and Thomas Powell came about half-way last time. It’s not clear that there is such a thing as “home advantage” in puzzle championships – indeed, dragging attention away from some of the top solvers to be on the organisational side must be a disadvantage, and the Dutch and Hungarian sides look stronger than they were last year – but last year’s sixth place for the UK team showed what is possible. This is the point where the Canadians, French, Polish, Turkish and so on curse this preview for not highlighting them. It would be a delight for any of them to take this as inspiration to prove this preview wrong, especially if I’ve swept them aside into just the “and so on”! This World Puzzle Championship is trying something different on the Sunday Saturday by featuring one final team round with very considerable bonus points on offer to the fastest finishers, almost analogous to the play-offs that have long been a part of the individual competition. Indeed, the fastest eight teams will get a second round of puzzles, in which the team members themselves will move about the life-size grids to demonstrate their answers rather than just putting dots on pages. My suspicion is that this final round will be crucial as to determining the overall outcome of the championship, and it may well be that at least two or three teams are in with a realistic chance at the start of this final round. It’ll be exciting! For the sake of punditry, if you make me pick a single winner… it would be safe and predictable to pick the USA as winners for a fifteenth time, but I think 2014 will be the year Japan win their second world championship. At the end of the Grand Prix, the 10 Sudoku GP solvers and 10 Puzzle GP solvers with the highest cumulative scores will be invited to the next WSC/WPC to play off in person. If there is a tie in the results of the top 10 solvers, the solver with the highest ranking in any individual tournament will win the tiebreaker; if there is still a tie, then the solver with the next-highest ranking in any individual tournament will win, etc. If any of the finalists decides not to attend the WSC/WPC, the next best solver (or solvers) will be invited to take part. The results of the online section have been published; you can see how they break down, event-by-event, though the interface for the detailed results is a little unwieldy. Essentially, the player with the most points in a contest (which will generally be full marks, plus a few bonus points for finishing quickly) earns 100 Grand Prix points for that contest, and everybody else scores between 0 and 100 in proportion to their score for that contest. Players’ five best 0-to-100 scores out of the possible six are added together to give an overall score, out of a possible 500, for the Grand Prix. 1. Ulrich Voigt, Germany (471.11/500) – Ulrich has appeared on the podium of the World Puzzle Championship every single year beginning with a “2”, and nine of those 14 appearances were on its top step. A dominant winner online, and surely a strong favourite for the play-off. 2. Ken Endo, Japan (447.66/500) – Ken had the sixth best score in the main body of the 2013 World Puzzle Championship, but as a member of Japan’s B team, did not make it to the play-off. Japan had a super-strong B team that year. See also Tom Collyer’s discussion of B-team members and their participation. 3. Hideaki Jo, Japan (443.95/500) – Japan’s best finisher at the 2013 WPC, third before the play-off but fell to fifth after it. Also has a third-place finish at the 2010 WPC, and is legendarily strong at the Nikoli online puzzle site, appearing several times on their hall of fame. 4. Kota Morinishi, Japan (433.50/500) – eighth at the 2013 WPC, improving further on an eleventh-place finish at the 2012 WPC. 5. Michael Ley, Germany (414.74/500) – fourteenth at the last two WPCs, but has a vast amount of experience having appeared at the WPC since 1996 with four fourth-placed finishes along the way. Also a 5th dan solver at croco-puzzle. 6. Bram de Laat, Netherlands (412.71/500) – fourth at the 2013 WPC, improving further on a seventh-place finish in 2012, earlier WPC appearances stretch back to 2003 and has an excellent puzzle blog on our blogroll. 7. Yuta Nagata, Japan (401.66/500) – another Japanese B-team member at the 2013 WPC, finishing with the 21st highest score. Please forgive how little I have to say about the Japanese solvers, other than admiring the Japanese strength in depth. 8. Nikola Zivanovic, Serbia (392.68/500) – the reverse of Kota Morinshi, an official eleventh-place WPC finish in 2013 and an eighth-place WPC finish in 2012! WPC final appearances stretch back to 2005, with a sixth-place finish in 2009. 9. James McGowan, UK (389.81/500) – sixteenth in the 2013 WPC, nineteenth the year before. Arguably his best result to date is the 2014 UK Puzzle Championship, where he came first not just in the UK but globally, and look at the names he took in doing so. 10. Neil Zussman, UK (386.07/500) – 15th, 25th and 10th (in reverse chronological order!) in the three most recent WPCs, and as dominant in the 2013 UK Puzzle Championship as James was this year. The play-offs will take place at the 23rd World Puzzle Championship, being held this year at Croydon, here in the UK. It’s certainly a bonus that the UK has two representatives set to be invited to the final ten. Many thanks to the World Puzzle Federation for organising the event, and to all the puzzle authors; it’s great to see a World Puzzle Federation event genuinely accessible to all hobby solvers, rather than just catering for world-class competitors. (Some rounds more so than others! Perhaps there’s scope to ensure that every round has sufficient low-hanging fruit to let the more modest competitors, like me, enjoy the whole of the 90-minute rounds.) 486 competitors took part in at least one Puzzle GP event; let’s look forward to next year’s season.